Rush Limbaugh received a telephone call yesterday from a woman named Angela. She’s a Christian who has been married 27 years and is a wise woman! They were discussing a new policy that has been instituted at Princeton. If you don’t believe that universities are poisoning our culture (as Dennis Prager consistently states on his radio program), you sure will now. Then Rush wanted to know exactly what she meant by the word submission and he made these comments in order to clarify what it doesn’t mean. Here Rush has painted her in a corner and she answered, “No” but qualified that she absolutely would do anything her husband asked her to do as she had stated previously; “the woman should do whatever her husband wants her to do.” She has no problem serving and pleasing her husband! Rush knows that a woman builds up her home or tears it down with her own hands (or mouth). He understands the power women have in a home and how destructive feminism has been for marriage and family. Submission is not something a husband can force. Submission doesn’t make a husband dominant and cruel. It’s God’s perfect prescription for women to actually win their husbands (1 Peter 3:1) and adorn themselves (1 Peter 3:5). It’s a beautiful word that culture has twisted and made to look ugly as they miss out on strong, happy marriages while marching down the broad path that leads to destruction. Stay on the narrow path that leads to life, women. Live in cheerful submission to your husbands; for this not only pleases the Lord but makes your husband a very lucky (blessed) man! For after this manner in the old time the holy women also, who trusted in God, adorned themselves, being in subjection unto their own husbands. I love that last paragraph you wrote here. Beautifully done Lori. This reminds me of a recent conversation I had with a friend. It was a friendly conversation and no angry words or hurt feelings happened, just to be clear. She was talking about some women that went to a certain church and how they wanted to go to the gym to workout, but there husband’s wouldn’t let them. I told her that if my husband said he didn’t want me working out, I wouldn’t. She said even if you’ve done nothing wrong or gave him any reason to believe you were doing anything other than working out? I said yep, even then. I told her that she knew me long enough to know my stance, and she said well your husband wouldn’t do that, he doesn’t mind you coming to work out. I said you’re right, but IF he did, I wouldn’t come. She said well I know you believe in submission, but if there’s no reason for him to doubt you, then I think it’s ok. I said, if you are picking and choosing what you are submitting to, then you aren’t submitting. She just couldn’t wrap her mind around it. I think she understood what I was saying, she just didn’t agree with me. She kept saying your husband wouldn’t do that, and I kept repeating you’re right, but IF he did, I would obey. “…if you are picking and choosing what you are submitting to, then you aren’t submitting.” Excellent point, HH! I so pray my sons will be able to marry women like this. At 27 and 29 they are not feeling too hopeful. They are to find. They are out there, Sheila! Don’t give up hope and keep reminding yourself that God is in complete control. With caught this exchange yesterday while listening to Rush at lunchtime. He let Angela talk and share what it meant to Biblically submit to her husband. 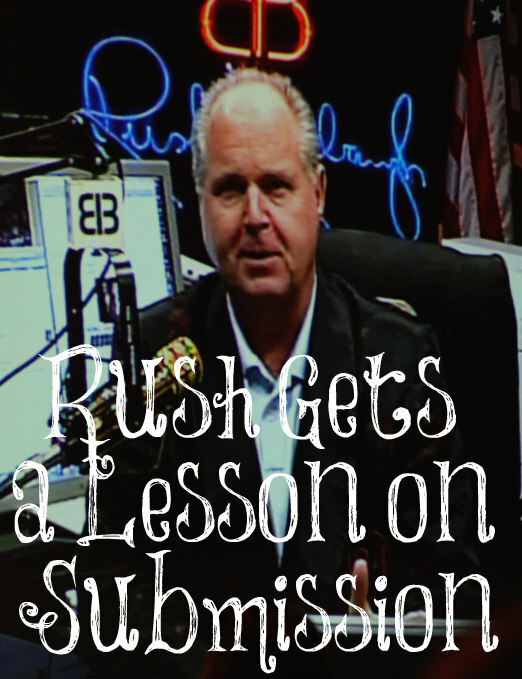 Rush was able to share how society is so far away from God’s plan and how society even criticizes this point of view. We need to continue to pray for Rush and other like them who are out there tryign to uncover the truth and to share the truth. I know that his brother, David, is a strong believer so I am sure he speaks to Rush often about it and it sounds like Rush does know some of the Word.